Most students at Bonwire, a Kente-weaving town in the Ashanti Region, have abandoned school and taken to Kente-weaving to earn money to fend for themselves. Those already in school have no interest in education as they miss classes every now and then in order to sell their woven items. It only takes the arrival of a 'posh' car in town for the students to abandon their classrooms in order to be among the first to meet the tourists and sell their products. Parents of most of the children leave their children to fend for themselves as soon as they realise that the children are interested in weaving Kente. This is primarily because they know the children will make a lot of money to provide for their needs. A child at age six is able to spin loose cotton yarns onto a bamboo stick to prevent the thread from entangling during weaving and they do this for a fee. A total of 24 yarns of cotton are spinned at a cost of ¢5,000. By the time a child is seven years old, he should be able to weave bracelets for sale. In fact, a boy is considered lazy by parents if at the age of 10, he doesn't know how to weave a piece of Kente cloth. A 16-year-old JSS graduate who gave his name as Kennedy said it took him a great deal of sacrifice to complete JSS successfully as he constantly had to monitor the movements of tourists who came to the town every now and then to buy items. Kennedy said it only took a joyous shout of “acerti”, meaning everything is certain, for every child whether in school or at home to rush out of their various classrooms and houses to see what they can sell off to visitors. “I can't remember when I started weaving, I think I was about six years old. Now I can weave Kente, bracelets and key holders as well as purses”, he said. In a day, Kennedy said he could spin about 48 cotton treads for the Kente weavers for ¢10,000. Kwasi now 18, was 10 years old when he dropped out of school due to financial problems. He said his father told him that if at his age he could not weave and pay his school fees, then he would not help him. “So at first I was weaving and attending school but later I stopped because I saw that weaving was more lucrative than being in school the whole day. This is because the one kente cloth is sold between 400,000 to 6,000,000”, he explained. Eric Amankwa, a 17-year-old SSS student who came out of class to exhibit his wares when he saw the Junior Graphic team said he sells to tourists and also weaves specific designs on request of customers. He said he often travels to different parts of the country where tourists often reside to market his wares. Asked whether his 'business' did not affect his studies he answered in the negative. According to him, did everything before he embaks on his business travels unless a surprise class test is organised whilst he was away. 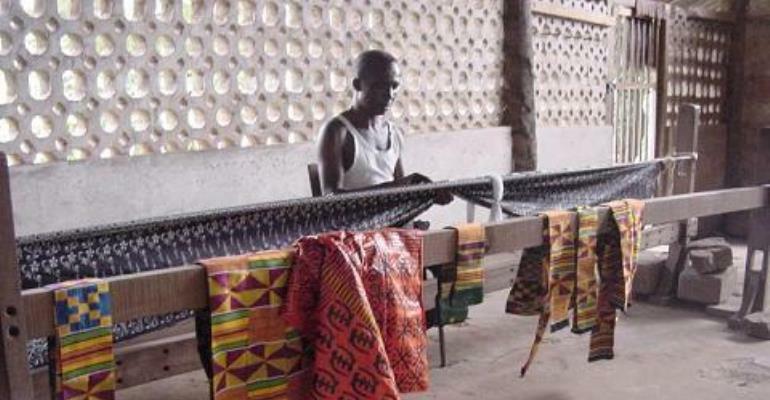 Mr Eric Kwarteng, the Secretary of the Kente Weavers Association, said the problem was at its peak now as a lot of school going children have dropped out of school and taken to the Kente business. He said this was because the children believed that there is more money in weaving Kente than going to school. “Most children here think that going to school is a waste of time. Mr Kwarteng said there was no specific age that one could start learning to weave since that is the main occupation of inhabitants of the town but said that most parents encourage their children to learn weaving at very tender ages. “As the child starts weaving and begins to earn money he is left by parents to fend for himself. Since most children are branded 'lazy' when they are unable to weave at tender ages, most children in the town try to impress the parents by concentrating more on weaving than school work”, he explained.